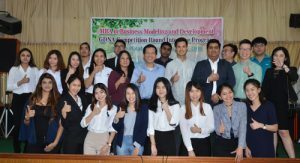 On 6th – 8th July 2018, MBA students from both Sathorn and Salaya campus attended the intensive competition round of global business simulation game as a part of the ICBM611 New Business Implementation and Integration course, conducted by Asst. Prof. Dr. Chanchai Phonthanukitithaworn at Baan Pla Tub Tim, Samut Sonkharm. The aims of this program are to allow the students to understand strategic options for competing globally and the corporate motivations for entering internal markets and more importantly to give them the opportunity to “learn by doing”. We were also honored by four experts from the industry and academic to join us as potential investors and share their practical experiences and constructive comments. Our four experts include Khun Preecha Anekwasinchai, Senior Vice President & Head of Balance Sheet and Liquidity Management from Bank of Ayudhya PCL, Khun Damien Durand, Corporate Venture Capitalist and Khun Parin Kienthong, Legal & IP Services from True Incube, and Asst. Prof. Dr. Olimpia C. Racela, Marketing Lecturer from Mahidol University International College.